I’ve been partnering with the Commonwealth Museum in Boston to tell stories about Massachusetts history in a whole new way. The podcast we’ve created, “Voices from the Vault” brings to life some of the most unexpected moments in New England’s history. Our latest podcast is about Anne Hutchinson. You know Anne Hutchinson – she’s the Puritan woman who managed to get kicked out of Boston, helped found Rhode Island, and then got murdered in upstate New York. She’s a Puritan, a rebel, and a founding mother. Amazingly, the only records we have of her own words are the transcripts of her infamous trial. So what do we really know about Anne Hutchinson? And what made her so remarkable? The best part about working in media production is getting to meet incredible people with unbelievable stories. This summer, I was fortunate to meet Mary Pratt, a former member of the All American Girls Professional Baseball League — the same league that was the basis for the film A League of Their Own. In fact, Mary was a pitcher for the Rockford Peaches, the team made famous by the movie. 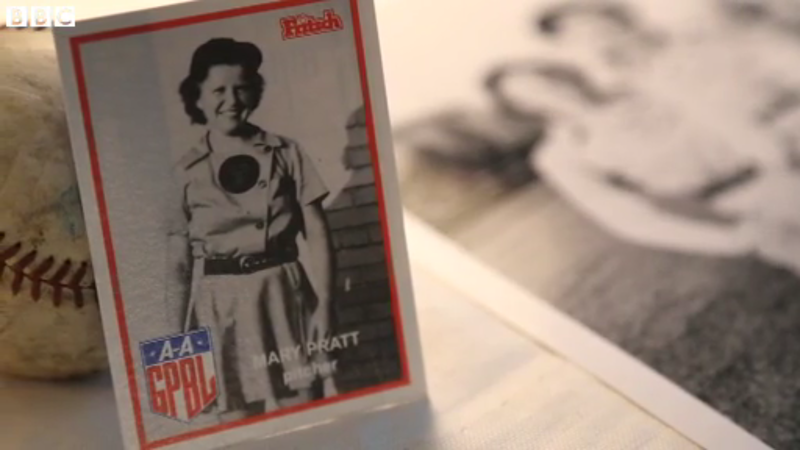 I assisted in field producing a video about Mary and the AAGPBL for the BBC program Witness. I asked Mary questions on behalf of the UK producers, since she has a little trouble hearing on the phone these days. I also found artifacts and photos from Mary’s baseball career for our videographer to film. Though it’s been a while since Mary threw a pitch herself, she still advocates for women in sports. I feel fortunate to have helped to bring more attention to her story. It’s been a surreal week in Boston. First, two bombs exploded at the 117th Boston Marathon, injuring almost 200 spectators and killing 3 people. Then, just as it seemed the chaos was winding down, a violent manhunt stretching from Cambridge to Watertown put the whole city on lockdown. On Wednesday night, the in short time between the bombings and the lockdown, I went to the Washington Square Marathon Sports store in Brookline, where a group of almost 50 runners met to go on a run around the nearby Chestnut Hill Reservoir. We ran to remember the victims of the bombings, celebrate the running community, and most importantly, to lace up our shoes and get in a few good miles. I produced a story for the CBC’s Day 6 about that run, and had the privilege of working with an incredibly supportive staff up in Canada. You can listen to the story on its own, or the entire podcast on the Day 6 website. As a Chicagoan and a fan of good movies, I was saddened to hear of Roger Ebert’s passing. While many have written about his tremendous contributions to film criticism, I feel that Ebert’s lasting legacy has to do with his remarkable ability to adapt to changes in the media business. While his colleagues bemoaned the end of newspapers, the end of local TV, the end of long-form writing, Ebert simply sought out the next big thing in digital media and mastered it. I hope to be that flexible as I grow in my career. I wrote an article about Roger Ebert’s legacy for Spinoff, which you can read here. I was thrilled to work with the team at WiserTogether to create a video introducing their American Health Survey. It was a pleasure to work with Dr. James Herndon, an accomplished physician and scholar at MGH here in Boston. For this video, I produced, shot, and edited all the original footage. You can watch it below!